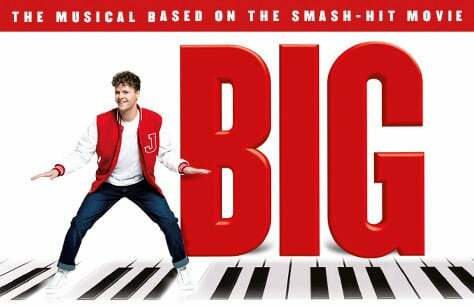 Big The Musical makes its long-awaited West End premiere at the Dominion Theatre this autumn following hit runs in Plymouth and Dublin. Tickets for Big The Musical at the Dominion Theatre now on sale! Witness the beloved 1988 film spring to life for the first time ever on the West End stage. Having first premiered in the UK at the Theatre Royal Plymouth in November 2016 before heading to the BGE Theatre in Dublin during Christmas that same year, Big The Musical is finally set to premiere at London’s Dominion Theatre this autumn after nearly two years of production limbo. The Irish production of Big The Musical most notably starred Jay McGuiness of The Wanted, an early 2010’s boyband that gained traction for their hit singles “Glad You Came” and “All Time Low”. McGuiness, who stepped into the role of Josh Baskin originally made famous by Tom Hanks, is set to reprise his role for the London premiere. What is Big The Musical about? This feel-good musical is based on the classic Tom Hanks film of the same name and follows a twelve-year-old boy named Josh Baskin, who thinks his life as a kid is dull. One night while at a carnival, he tosses a coin into a Zoltar fortune-telling machine and makes a wish to be 'big'. But after the arcade-like machine says his wish has been granted, Josh is shocked to find it had been unplugged the whole time. Shaken from this revelation, he returns home and goes to bed, only to wake up the next morning as a fully-grown, thirty-year-old man. Forced to do what normal adults do and get a job and a girlfriend, Josh soon begins to wonder whether it's actually worth being all grown up after all. This hilarious and big-hearted show features a clever book by John Weidman and an unforgettable score by both Richard Maltby, Jr. and David Shire that will have you wishing big on the next falling star you see. It has been confirmed that The Wanted's Jay McGuire will reprise his role for the big West End premiere of Big. Further creatives, as well as the full West End cast, will be announced in due course. Be sure to follow our news page for all the latest announcements. Big The Musical has been on the #WestEndWishList for quite some time now, but Zoltar has finally made fans' dreams come true. Big The Musical starring Jay McGuiness is officially heading to the Dominion Theatre this autumn for a special, nine-week run that you won't want to miss. It's pure bliss and fun for the whole family. Book your Big The Musical tickets early to avoid disappointment!